The Center for Immigration Studies hosted a panel discussion on Tuesday, March 28, focusing on the impact of immigration on schools and the broader implications on American society. The starting point for conversation was the Center’s report that merges Census Bureau data with Google maps to provide a visual representation of the impact of immigration on public schools at the local level in every state and metropolitan area. Dr. Camarota, director of research at the Center for Immigration Studies, will present his recent publication, Mapping the Impact of Immigration on Public Schools. Salam is the executive editor of National Review and a policy fellow at the National Review Institute. He is also a contributing editor of National Affairs. Skerry is a professor of Political Science at Boston College and was co-director of the Brookings-Duke Immigration Policy Roundtable. Rangel is the President of Mastery Consulting, LLC, former chief executive officer of the United Neighborhood Organization, and the founder of UNO Charter School Network Inc., which includes 16 schools in the Chicago area. MARK KRIKORIAN: Good morning. My name is Mark Krikorian. I’m the executive director of the Center for Immigration Studies. And we’re releasing today a report and having a discussion about immigration in public schools. And this is relevant to the assimilation question, which is the – kind of the thing that we pegged it to because the schools, the public school system really is the primary institution for the Americanization of young people, of immigrants who come as children, or the children from immigrant families if they came as immigrant themselves. And in fact, it’s not too much to say that the public school system, back then called common schools, were invented to Americanize immigrant – kids from immigrant families. So, you know, this is – this is really – the nexus between the issue of assimilation and public schools is significant. And so first we’re going to have a presentation on the numbers. This isn’t about – the numbers that we’re looking at are not showing whether assimilation is happening, isn’t happening. It’s not a measure of it. It’s really more a measure of the context within which the assimilation of young people from immigrant families happens. 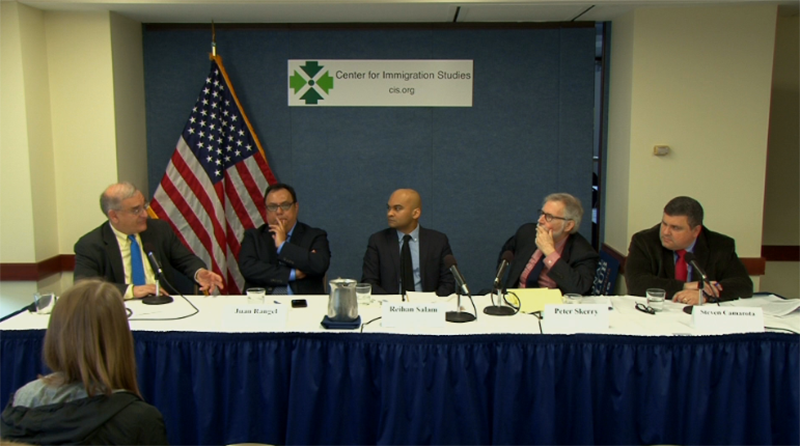 And the author of the report presenting it is Steven Camarota, our director of research at the Center for Immigration Studies, one of the nation’s top authorities on the impact of immigration on the United States. And then we’re going to have a discussion about both the implications of the report and just sort of generally on the issue of the Americanization of immigrants and their children. And we’re going to follow Peter the professor with Reihan Salam the journalist. He is executive editor at National Review. And he’s got, like, seven other jobs. He’s a contributing editor at the journal National Affairs. He’s on the board of New America. And he has more energy than I ever will have in my entire life. I’m just completely amazed. And then at the sort of greatest level of specificity, Juan Rangel, he’s now president of Mastery Consulting, but for quite some time he was CEO of United Neighborhood Organization, which is at times the biggest Hispanic community group in Chicago. And it’s relevant to what we’re talking about today because they had a series of charter schools with several thousand children, mostly from Mexican immigrant families, in them, and has, you know, significant experience in how this works and has written and talked about this issue pretty broadly. And so I think we’ll – he’s an important part of the conversation. So we’re going to start with Steve, then our three commenters, and then we’ll have a discussion Q&A. Steve? STEVEN CAMAROTA: Well, thank you, Mark. And thank you all for coming. The report we are discussing today maps the impact of immigration on the nation’s schools. The map is up there. I won’t be referring to it much, but we can in the discussion. It is authored by me and my colleagues, Bryan Griffith and Karen Zeigler. So what do we find overall? Overall, we find that the impact of immigration on schools is of course enormous. In fact – make sure I get this right – thank you – in fact, it is difficult to overstate the effect of immigration on our nation’s schools. Nationally, nearly one in four students comes from an immigrant household. That’s both legal and illegal. Of that one-fourth of all students, perhaps a quarter or a third are from households headed by illegal immigrants. And I remember most of the kids in public – in public schools who are in immigrant households were born in the United States, so only a modest fraction are themselves immigrants, but they come from immigrant background. Most of them are the children of legal immigrants, but the illegal component is pretty big too in Census Bureau data. Now, I guess the two big questions that the report raises but doesn’t answer is that the level of immigration or the number of kids from immigrant background in public schools is now so high in immigrant areas that it does raise profound questions about assimilation. What’s more, immigration has added enormously to the number of students who are in poverty or have low incomes or speak foreign languages at home. Now, all of this has occurred with little debate over the capacity of our schools to educate and integrate these children into our society, into our culture. So how do these numbers of about a fourth now compare to the past? Well, as recently as 1980, just 7 percent of public school students were from immigrant households. And in high immigrant states, the growth has been really extraordinary. Let me give you just couple quick examples. In a place like Nevada, between 1980 and 2015 it grew from 8 percent of public school students from immigrant households to 35 percent. In New Jersey, it’s gone from 11 to 34 percent. In Texas, it went from 10 to 31 percent. And even in areas like Kansas or Minnesota that you don’t normally think of as being heavy areas of immigrant settlement, the impact has been enormous. Now, as large as the growth at the state level has been, the local impact has been truly astonishing. The Census Bureau divides the nation into what is called Public Use Micro Areas, each containing about 20,000 public students – public school students in that area. It covers about six to 10, very roughly, high schools on average in one PUMA, one of these Public Use Micro Areas. Now, just 700 of the nation’s PUMAs account for about two-thirds of all kids from immigrant households. There are about 2,400 PUMAs total, but these 700 have a very heavy concentration there. They’re the majority of kids on – overall kids from immigrant households. I’ll give you a couple quick examples of how big some of the numbers can be. In north Hialeah City, which is near Miami, 93 percent of the kids in public school are from an immigrant household. In Annandale, Virginia, right nearby here, 78 percent of kids in public school are from immigrant households. In these 700 immigrant-heavy PUMAs, these census areas, one sending country typically, but not always, predominates. On average, the top-sending country accounts for about 52 percent of public school students or in a household headed by an immigrant from there. So not only do these kids from immigrant backgrounds going in areas where there are lots of other kids from immigrant backgrounds, but they’re not as diverse or the immigrant population is not as diverse as you might think. One country often, though not always, predominates. Now, another finding is that immigration doesn’t just add to the number of kids in school, of course, but it also adds to the population of kids who might be seen as at-risk or disadvantaged. Today in America, 30 percent of all public-school students living below the poverty line are from immigrant households. In some states, of course, it’s a lot higher. One state in particular stood out. And it’d be interesting to discuss, did this play any role in Trump’s rise? In the state of Minnesota, 39 percent of kids in public school are – in poverty now are from immigrant households. In a very real sense, there is a new poverty problem in Minnesota that is of immigrant origin. And you wonder why – or I did on election night – how Trump almost won one of the most liberal states of the country, Minnesota. And you wonder with public dissatisfaction with immigration in that played a role. But that gives you an example of how big the impact can be of immigration. Now, in local parts of Minnesota, the impact is much larger. Immigrants do often settle in high-poverty areas. If you look at the areas of the country where poverty tends to be highest, 200 PUMAs of census areas again where poverty is the highest, about a third of the kids are from immigrant households. So immigration does tend to create added challenges in areas already dealing with significant challenges. And, of course, immigration has added a lot to the number of kids in public school who don’t speak English at home, who need special language instruction. About one out of four kids in American schools today speaks a language other than English – obviously, at home. Obviously, it varies a lot by state and region. The other thing about immigration that’s important to remember is that immigrant households, while there are many very successful and very high-income immigrant families in the United States, a very large fraction have low incomes, as I said, are in poverty. On average the median income of immigrant households is lower, about 9 percent lower, than the median income of native households. So not dramatically so; there tends to be more earners in immigrant households. But immigrants have a lot more kids in public school on average. You can think of it different ways. There are about 63 public school kids per 100 immigrant households in the United States compared to 37 kids per 100 native households. So immigrant households are a good deal larger; about 69 percent more kids in public school, on average, in the immigrant households. But they’re poor, on average. So what this means is that immigration often creates a very large increase in enrollment, a very large increase in enrollment of low-income children, without a corresponding increase in the local tax base. And this is likely to create challenges and add to issues that the school system will face. And if the school system is already in an area where it’s struggling to meet the needs of kids from immigrant backgrounds, immigration can make that more difficult. Now, of course, it’s not just a matter of straining community resources, as we discussed. Perhaps the most important question raised by these numbers, but not answered, is assimilation. One way that assimilation works is that the preponderance of natives and their children in a school, town or neighborhood makes the absorption of American culture and identity maybe not inevitable but not very likely among immigrants and their kids because there are so many more kids from native backgrounds. If the immigrants are a modest share of the local population, it makes identifying with the United States and its culture maybe unavoidable or at least very likely. But the level of immigration in recent decades has been so high – and mostly, it’s been legal – that there are whole areas of the country where natives and their children are actually a small share of the population. I gave you some examples, but there are many others. And again, this may significantly hinder assimilation. Let me give you a quick example. Describing Santa Monica High School in California and the battle to reinstate the Pledge of Allegiance, the Los Angeles Times in January – this was a political battle that had occurred earlier, but in January of this year the Los Angeles Times reporter wrote, the Pledge was seen as widely viewed as a throwback to American patriotism that seemed outdated in the multicultural mashup of Los Angeles’ Westside. Now, that’s an interesting example of how educators who were hostile to bringing back, according to the article, the Pledge of Allegiance, but also the students themselves, they just didn’t – they couldn’t relate, the way it’s described in the article. They just were not interested. They didn’t necessarily want to say it. They chatted amongst themselves during that time. The Pledge was just seen as out of place and anachronistic. Now, of course, it’s reasonable to point out that America can be strongly argued to have said – to have successfully assimilated the descendants of immigrants during the last great wave, 1880 to 1920. However, a lot has changed since then. First, and maybe most important, the last great wave of immigration, 1820 – 1880 to 1920 ended, first by World War I and then restrictive legislation in the ’20s. By 1970 less than 5 percent of the U.S. population overall was foreign-born, a third of what it had been in 1910 when the restrictions were enacted and before World War I. Immigrant communities were no longer refreshed by new arrivals, thereby facilitating assimilation. There is certainly evidence that the dramatic growth in immigrant enclaves in recent decades has likely slowed the pace of things like language acquisition. There is research showing that the larger the immigrant community in a country or area, the slower the taking on of English is or the native language. At present immigrants represent about 13.5 percent of the total U.S. population. Now, that is the highest percentage in a hundred years. But the Census Bureau projects that the share will hit 15 percent in just six years. And that will surpass the all-time high in U.S. history reached in 1890. 1910 is the other peak, slightly lower than 1890. But both of them will be less than what we expect in 2023. Perhaps most importantly, the share is projected to increase throughout much of this century without a change in policy. In a very real sense, America is headed into uncharted territory on immigration. The share who are immigrants, who are foreign-born, will be at a level that we have never seen in the United States before. Now, second, similar to the past, many immigrants today have modest levels of education, but this is distinct from the past because unlike in the past, there are many fewer jobs that eventually became decent-paying jobs for people who didn’t have a lot of formal skills. The most classic example is factory jobs that became unionized, a lot of it in the ’30s, but wages were also going up in the ’20s. Just as an aside, historically, in the United States, from the teens to the ’50s, the period we are thought to have successfully, at least in many ways, assimilated immigrants, is a period of wage compression in the United States between the top and the bottom. That has not been the case for the last four decades. In general there has been a spreading out of wages, a greater inequality in wages with the more educated now making a lot more than the least-educated. The period 1910 to maybe 1955 was a period of compression. And that likely helped when it came to facilitating the economic integration and all that that implies with that last great wave. The world’s changed. Now, a third factor that’s changed since then of course is technology. We could talk about this forever, but very briefly, calling, texting, emailing, facetiming and visiting home countries now is relatively cheap and easy in a way it wasn’t in the past. And finally, the fourth big difference with the past is that there was more of a consensus in America about what we wanted from the immigrants or the assimilation. Louis Brandeis, the Supreme Court justice, in 1915 said, immigrants need to do more than just learn English and our manners. Immigrants, he said, quotation, must be brought into complete harmony with our ideals and aspirations. However, in modern America, this kind of robust assimilation is sometimes seen as in conflict with the ideology that has, in some ways, displaced it, of multiculturalism. The idea is that there is no American culture. Immigrants and their descendants should retain their identity, and America should accommodate the new arrivals rather than the new arrivals largely accommodating themselves to American culture. Now, of course, these questions are very complex, and many ordinary Americans still embrace a more robust idea of assimilation. An Associated Press survey just done last month found that a majority of Americans think the country should have an essential culture that immigrants adopt. But there no longer exists a clear understanding of what we want from immigrants. The lack of agreement means that immigrants often receive mixed messages about assimilation. As my colleague Mark Krikorian argues, this greatly complicates assimilation and can lead to significant misunderstandings. Finally, let me say of course the United States needs to educate children from immigrant households already here. Nearly one in four children, as I said at the outset, in public school today is from an immigrant household. So how these children do is vitally important, not only to them but to our country as a whole. However, a key policy question – not the only one, but a key policy question moving forward for our country is whether it makes sense to continue to admit 1 million legal permanent immigrants each year and to tolerate widespread illegal immigration without regard to the absorption capacity of our schools. Thank you. PETER SKERRY: Thank you, Mark. Thank you, Steve. And just wanted to say, it’s nice to be here. I apologize for being late and keeping everyone waiting. And I’m struck by the irony that it’s my fault, the person who lived and worked in Washington for 14 years, the third-generation son of immigrants, I’m the person who is responsible for bringing Juan here, who’s a colleague that I’m tickled to share the podium with. He, of course, is the children of immigrants. But I’m the guy who got us lost coming to – coming to this venue this morning, so I apologize but be mindful of the irony. So it’s a pleasure to be here with – commenting on this research by Steve and his colleagues, and to share the podium with Reihan as well – as well as Juan and Steve and Mark. I’m always impressed by the research that they do. I don’t always agree with its implications, but there’s no doubt in my mind that they’re the place to go to if you want to try to understand what’s going on not only in terms of policy, but in terms of the more fundamental dynamics of immigration in America, and I wish that they got much more positive attention for the good work that they do than they sometimes get. And so it’s all the more pleasant to be here. So, focusing specifically on this study, I, of course, am – agree with the broad stroke of the findings and the thrust of them – that there’s a growing share of public school students who are from immigrant households and who are either living in poverty or in foreign language situations, and that it’s extremely noteworthy and demands our attention; while at the same time, it’s one of these many impacts and costs of immigration, this particular set of data, this trend, that gets overlooked in gross positive images and the kind of feel-good images and the totalistic view of immigration from a bird’s eye national perspective that we often get when we debate immigration, particularly here in Washington. It’s this local impact on school districts and local jurisdictions that – fiscally, especially, but not exclusively – that Washington political and policy elites often selectively overlook and do not squarely address. After all, the fiscal burdens of the kinds of problems that the research focuses on are borne mostly by state and local governments, while our immigration policy overall is made at the national level, obviously. So I applaud this work in further elaborating that more localized impact of immigration, where the impacts are so evident to people in their ordinary daily lives – immigrants as well as nonimmigrants. What I want to focus on is the theme of assimilation, which is what I’ve been asked to talk about, and didn’t know I was the most theoretical person here, but I’ll run with that. (Laughter.) So I hang out with people in academia where theory is more exalted endeavor than anything I do. But in any event, I have no disagreement or doubt that these numbers pose serious problems and challenges with regard to the assimilation of the students and the young people in the schools, immigrant and nonimmigrant alike. My questions and concerns have to do with what we mean – what we mean as a people, what Steve means as a researcher, what Mark means as a policy analyst, or what any of us mean by assimilation. It’s one of these terms that is so slippery and so fraught that it requires us, I think, to be very specific about what the context and meanings mean and what their history has been and how assimilation has been interpreted over time. First of all, I have no problem with the term “assimilation,” and I applaud its use here. It’s a common-sense term that is how people – ordinary Americans, certainly, talk about immigration, talk about its impacts, understand its impacts. It’s what they expect immigrants to do. It’s, I think, what immigrants basically expect themselves to do, albeit what it means is always – seems always fraught. But I have no problem with the term and object strongly to many of my academic and colleagues in the policy field who find it problematic or offensive; I think they’re playing word games. I think we’re talking about some fundamental process here by which most Americans, most immigrants understand assimilation, broadly considered, to be the process by which they adapt and make a success of their lives here in America. Now, that’s awfully general, awfully broad, but that’s not – that excludes the much more draconian notions of assimilation, the much more coercive notions of assimilation that are often imputed to the term. So I’m very happy to embrace the term and use it myself, and I’m glad that CIS uses it as well. But what is meant by it? What does Steve mean by it? How do we understand it? That needs to get focused on, and I want to spend a few minutes doing that. And let me read the key paragraph in the study, where I begin to ask questions. Right after the discussion subhead, the report states: one way that assimilation works is that immigrants and their children get lost in a sea of natives making the absorption of American culture and identity almost inevitable. If immigrants are a modest share of the local population, it makes identifying with America and its culture practically unavoidable, but the level of immigration, most of it legal, has been so high in the last four decades that there are now whole sections of the country where natives and their children are actually the minority or nearly so. This has the potential to fundamentally change the terms of assimilation. Parts of that I agree with; parts of that I want to raise questions about. First, the terminology about immigrants and their children getting lost in the sea of natives, that that’s what assimilation broadly construed can be. I want to stop and look at that for a moment. MR. SKERRY: You changed it in the report? MR. CAMAROTA: Just so you know. But that’s OK.
MR. SKERRY: OK. But whether or not you use it in the report, like you say, it’s a way of thinking about assimilation that we should stop and look at. You know, getting lost, first of all, is the way many critics of assimilation define it; that you want us to get lost in this, you know, broad, homogenous American culture, where we’re going to lose our souls and lose our history and lose our sense of ourselves. I don’t think assimilation has worked that way in our past. I don’t think it ought to work that way, and I don’t think it does work that way today. So it’s an unfortunate connotation, but also I think it’s a mischaracterization of the process. So, too, I would criticize the terminology “in a sea of natives,” because I don’t think of America as a sea of natives. I’m not saying you can’t think of it that way, but I don’t think if we’re trying to understand assimilation that’s a helpful way to think about it. We don’t have a homogenous sea of natives in America. We have congeries of various overlapping – I emphasize overlapping – and interacting subcultures. We certainly have that today. And while I don’t consider myself a multiculturalist and I don’t tend to invoke that term, we have long been a pluralist society where immigrants’ subcultures change, adapt to various aspects of American society, some of which go back to our founding, some of which are reflections of previous waves of immigrants and their impacts. So I think that image is, again, an unfortunate and kind of misleading one. Sure, there are dominant aspects of American society and culture and politics, which is also an aspect of assimilation, that are more overwhelming, more demanding than others, but different immigrant groups adapt or not to these various aspects of this pluralistic society in very different ways. I think that’s a much more realistic and helpful way to think about assimilation. I don’t think assimilation is one single overarching process. It has different dimensions: economic assimilation, cultural assimilation, political assimilation, and those play out in different ways for different groups at different times. And different groups assimilate along those different dimensions in different ways. The Irish assimilated certain ways relying on politics more than the market. Jews assimilated much more through their professions and market mechanisms, relied less on political mechanisms. But they both, broadly construed, assimilated but followed rather different paths, for example. Next, if immigrants are – as the report says, if immigrants are a modest share of the local population, it makes identifying with America and its culture practically unavoidable. Well, I’m not sure anything in life is practically unavoidable, but I know that – I know what you’re saying, but I’m just not sure that’s true. I think about Japanese on the West Coast leading up to World War II. Lots of Japanese were assimilating, in the terms in which Steve and I would agree upon: learned English, were integrated into society economically, war – saw themselves as Americans first but Japanese second, perhaps. But many Japanese didn’t assimilate that way – quite clearly not. It’s a controversial topic, I understand. I think America, by and large, acted – overreacted to what was – to what happened, but it was in response to a rather momentous event, obviously. I don’t want to go down that path right now. All I’m trying to suggest is that there were problems with Japanese assimilation, particularly in terms of what nation that some Japanese identified with, even before Pearl Harbor, and they were a very small group of people. And why that was is a complicated story. So I’m not sure it’s simply a function of numbers. I don’t deny that large numbers of immigrants of the sort that Steve adduces here have implications fiscally in terms of what – the resources that are required, and that those – that those resources aren’t often faced up to. But if we’re going to try to understand assimilation, I think we need to understand that it’s not always quite the way I think it gets modeled here. Moving along, because I don’t want to take too much time up, when the report refers to large concentrations of – that fundamentally change the terms of assimilation, I understand what is being driven at, but when it – this notion of inevitably, again, I think, is problematic. I don’t think it plays out quite the way is suggested here. I think – my view, what I would put on the table for discussion, is that assimilation in its common-sense meaning, the way in which it’s typically understood – well, let me put it this way. Assimilation in the way that – let me back up a second. Assimilation in the sense that many social scientists who look at these issues carefully – carefully – is virtually inevitable that one way or another immigrants adapt to their context, OK, and that their context in a crowded urban school in the United States is not the context that it is where they came from, almost by definition, OK? It’s a matter of what they’re assimilating to and how they’re adapting and changing to the context they find themselves in. There’s no – again, as I said just before, in our pluralistic society, I don’t think there’s one all-encompassing sphere or culture that immigrants adapt to today or have adapted to in the past. Yes, we have one dominant language and I think we should. Yes, we have one sovereign nation that demands – albeit we’re not quite sure what some of that means today – demands allegiance. But there’s many other spheres of social and political life where adapting is much more situational and plays out in different situations and different contexts in different ways, and I don’t consider that necessarily problematic. So there are lots of assimilation possibilities and options, I would say, and as I’ve said, they’re possibilities. Part of what I’m suggesting – and disagreeing with Steve – is that assimilation is so – is sufficiently open-ended, that it’s not the coercive dynamic that many of its critics would have us believe, which is why I’m glad that the term gets used here, but I think, again, it’s a very slippery term. So we are – the bottom line is that assimilation is not a one-size-fits-all process in this pluralist society. We may not be multiculturalists, but we are and have been for a long time a pluralist society with lots of different possibilities, lots of different power centers and politics, lots of different spheres that immigrants can and do – and adapt. Now, I don’t mean to paint a rosy picture here. They can adapt to these different spheres, these different subcultures, these different contexts in ways that are very unfortunate. That’s why sociologists talk about the problem of some immigrants in urban poverty settings assimilating down, down into gang culture or down into dysfunctional cultures. They’re assimilating, but they’re assimilating down. Or they’re assimilating in various negative or counterproductive or dysfunctional ways, in the way that Mexican immigrants – there’s lots of evidence now – are assimilating to our food culture – to our fast food culture in ways that leads to problems with obesity and diabetes. That’s a particular assimilation problem. It’s not a problem of not assimilating; it’s assimilating in a dysfunctional way. Obviously, many immigrants assimilate in much more – what most of us consider would be positive ways: assimilating from humble origins into the middle class, upper middle class, making it, you know, in an economic and political – other spheres. But the point is – and I’ll try to finish up here – that these processes happen. They happen one way or the other – negatively or positively. It’s not one single, coherent process, but they do require attention. We can and often seek to give these processes a direction. If there are problems of assimilating into gang culture, arguably we need to pay attention to that. Part of what we may need to pay attention to is that large numbers of populations that have large numbers of children who aren’t well educated, who may have problems getting educated, may well be susceptible to gang subcultures. We haven’t been able to intervene in those situations very well. That may raise questions about whether we want large numbers of unskilled immigrants, who are likely to have large families, arriving here, fair enough, but I think that’s a different way of understanding assimilation. So my point is that such outcomes – desirable outcomes of assimilation, which we don’t always agree upon, which – that’s part of a problem of our politics and our policymaking – inevitably require resources, it seems to me, particularly the ones that are left to their own devices, obviously, that lead to negative outcomes. To the extent that we know how to intervene to direct those forces of assimilation in more positive directions, then I think that’s what we need to do, but that’s, of course, what we don’t often do because we still today, in this period when in many ways immigration is much more of a live issue, where there’s a possibility of perhaps looking at it more constructively than we have in a generation – we still tend to look upon immigration as a free good – that this is something that we can’t or don’t want to stop and that there’s a process that takes over rather automatically, or that we just don’t want to pay attention to its problematic nature or its negative outcomes, which is often how immigration gets talked about in the media and among elites. So, if we’re going to face up to the problems of assimilation, we have to understand and be more precise about what it is in its various dimensions, that it’s, in one way or another, inevitable to be more mindful of the ways that we may intervene and alter what direction it takes and consider the implications of our abilities to intervene, to move it in more positive directions. That has implications for who we let in, but it also has implications for the resources that we’re prepared to invest in immigrants. And on those two last points – our ability to focus on who we want to let in and how we can affect the assimilation in a positive direction for those we let in and what it’s going to cost us and what we’re prepared to put our money where our policies are – those are the questions that I think we need to be more mindful of. And those are the questions that I think Steve’s study ultimately pushes us toward considering. MR. KRIKORIAN: Thank you, Peter. REIHAN SALAM: So I imagine a lot of you guys have read stories in the paper about Millennials and how many Millennials live with their parents. You have people who are in their 20s, oftentimes are only imperfectly engaged with the labor force, and they’re living at home and they’re relying on private transfers, meaning the bank of mom and dad, in order to ensure that they’re living a decent life. But imagine the difference between someone who is living at home in mom and dad’s basement and that basement is, let’s say, the 20th floor of an apartment building on the Upper East Side, versus living in mom and dad’s basement; if mom and dad are struggling people who have very limited resources and are living in a community where you have to share this tiny apartment with a number of other relatives, a number of other people who really need your resources. It’s the same phenomenon. It’s a young person who is coming home and to rely on parental resources. But in one case, you have a family that is richly endowed with resources, both literal and figurative. By literal I mean it could be money. It could mean I own property. By figurative, I mean, well, you may well be embedded in a kind of social network that gives you access to more opportunities. I am a big – I’m going to throw out some buzz words to you guys. I’m a big believer that two of the chief problems this country faces and two of the chief problems this country has faced for decades are ethno-racial inequality and multigenerational poverty. So “ethno-racial inequality,” what do I mean by that? What I mean by that is a society in which people at the top of society look very different from people at the bottom of society in a way that is very durable and creates this very lasting pattern that creates negative stereotypes and much else that can become really toxic. Then, when we’re looking at “multigenerational poverty,” what do I mean by that? Well, when you look at poverty, some of it is intermittent, meaning that, you know, I might have had – let’s say I had an accident so I can’t do my job that requires a lot of physical dexterity. So I temporarily am poor, but then I go back to the class status that I had before. I go back to making a living, versus chronic poverty, meaning that I’m constantly falling below the poverty line. No matter how hard I try, because I have limited resources, because I have a limited social network, an impaired social network, it’s extremely hard for me to kind of climb that ladder. So multigenerational poverty is when you have chronic poverty in one generation and then you have children who are suffering from chronic poverty as well, and that pattern recurs and recurs and recurs; so, again, ethno-racial inequality and multigenerational poverty. And the problem is, in the United States these two problems tend to coexist. They tend to overlap. A lot of folks who are part of the multigenerational poor are also people who are part of underrepresented groups. They’re part of groups that have been stigmatized and disadvantaged. MR. KRIKORIAN: Reihan, I think we lost sound. MR. KRIKORIAN: Just hold on for one second. When we think about immigration policy, I tend to think that we should think about it as secondary to the challenges of multigenerational poverty and ethno-racial inequality. Is our immigration policy making it easier to tackle these challenges, or is it making it harder to tackle these challenges? And the reason I believe this to be the case is that, OK, imagine a society 20 years from now in which pretty much everyone who is upper middle income or rich is of Asian descent or of non-Hispanic white descent. And if you have a working class and a non-working-poor class of society that is disproportionately people of color – non-Asian, disproportionately Hispanic, OK – would that society be seen as a fair or just society? Is that going to be a society that has legitimacy in the eyes of people who are at the bottom of that society? My sense is that the answer is no. So how do you prevent that outcome from coming to pass? My sense is that what you need to do is be sure the institutions that are devoted to facilitating upward mobility are working; they’re working well for everybody. And I think that if you’re looking at our country right now, I think it’s safe to say these institutions are not working well for everybody, particularly if you’re in the bottom two-fifths of society. So when Steve is talking about public schools and he’s talking about public schools which have a high concentration of folks who are from immigrant households, who are very poor, we’re talking about a situation in which you’re expecting children to make an enormous leap from one generation to the next. So, basically, there are two ways of talking about mobility. There’s absolute mobility and relative mobility. Absolute mobility means I make more money than my parents in literal cash terms. Relative mobility means that my class status improves over time. If I come from Bangladesh to the United States, my absolute mobility is extraordinary in the first generation. I am earning far, far more than I did before. But if I’m the child of someone who is a Bangladeshi immigrant, who is extraordinarily poor, who’s living in a neighborhood with a high poverty concentration, and also I have limited social networks – my social network consists largely of other poor immigrants who are occupying this other kind of low-end niche of the economy, other people who are primarily working with their brawn rather than their skills and what have you – then I have limited resources that I can pass on to my child. What my child needs is for the school system, the public schools, and for other public institutions to help close that extraordinary gap between that kid and other kids who are in the middle class or in the upper middle class. On top of that, we have this intense stratification in which you have upper-middle-income parents who are devoting more and more time to their children’s education, a model people call high-investment parenting. OK, most immigrants, as Steve mentioned, are very heavily concentrated in a small number of districts and cities and what have you. Really, they’re concentrated in about six metropolitan areas in the United States. Now, most of these metropolitan areas are places where even getting on the housing ladder is extremely difficult. If you’re in the San Francisco Bay area, if you’re in New York City, if you want to own a home, oftentimes you’re not just relying on your own income. Sometimes you’re relying – if you’re someone who’s in your 40s, you might be relying on parental resources, right? I mean, this – so these intense intergenerational inequalities get compounded over time. OK, so now let’s think back to that second generation, these kids who are in public school right now. If what it takes to get on the housing ladder is not only to have parents who have resources, including social capital and cultural capital, it’s having grandparents who have those resources, it’s a really extraordinary thing. What we’re asking people to do is make this enormous social leap from being at the bottom of an hourglass economy to being at the top of an hourglass economy, because, as Steve was suggesting earlier, those middle rungs of society are just not really there in the same way they have been before. So, again, you know, this is fine if you think that no one cares about ethno-racial inequality; no big deal. Who cares if everyone at the bottom of society looks one way and everyone at the top of society looks another way? If you believe that that’s not going to cause enormous social tension in our society, then fine. We don’t really have to worry about it. It’s great. Hey, the first generation made this huge leap in absolute terms. Just because their children aren’t making the same leap, no big deal. Who cares? But I would suggest that if we’re looking at modern America, we see an enormous amount, again, of tension and kind of doubts about the legitimacy of our society when you don’t have that representativeness. And I think that there are good reasons to worry about that too. So when we’re thinking about this, again, folks who are coming from low-income immigrant households really depend on the public sector to work. So what are the conditions that allow the public sector to work well? One thing that we hear a lot about now, for example, is the idea of early-childhood education, early-childhood intervention. I have news for you guys. If you are going to have extremely intensive early-childhood interventions for folks from low-income households, it’s not free. Not only is it not free, but actually the teachers, the people who provide them instruction, there’s this growing pressure to ensure that those are people who have adequate training and preparation. People with adequate training and preparation in our society, they do not work for a smile and a candy cane. They work for a wage. They expect to be paid well for the kind of education and training that they have, OK? So what this means is that we’re going to have to apply far more resources. When we talk about the immigration debate, we often talk about the net fiscal impact. You know, are people going to be paying more in taxes than they receive in benefits? Well, what we’re saying is if we take multigenerational poverty and ethno-racial inequality seriously, we are going to have to redistribute more. We are going to have to devote more resources to poor folks who come from families that have limited social networks and have very low parental resources. So what that means is that if we have a net fiscal cost now associated with large amounts of low-skilled immigration, that means that cost is going to have to go up by necessity if we want to avoid this disaster of having a society in which ethno-racial inequality is more intense rather than less intense in the future. So basically, if we had zero immigration from now on, if we just magically were able to kind of cut it off entirely, we would have the landscape that Steve describes in his report. You have a landscape in which, in the state of California, about 48 percent of kids are coming from immigrant households. And a large majority are from low-income households, meaning below 200 percent of the federal poverty level. These are people where, if you deny them Medicaid, it’s not like, oh, cool, OK, I guess I don’t need health care anymore. That’s awesome. That totally worked out. No, they need those services. It’s going to be a situation in which you are a parent who is in poverty and you have to work. Well, your child is not going to have supervision. And if you don’t have early-childhood education, if you don’t have after-school programs and other resources for that kid, it’s not like, oh, that’s all going to work out just perfectly. And that kid from that background is going to become, you know, a software engineer, is going to be working in some other high-end profession. That might happen every now and again, and we as a society fetishize those examples of the tiny handful of people who overcome those odds. But the truth is that, on average, if you come from that kind of background, you’re going to struggle. So then, again, if you believe that ethno-racial inequality and multigenerational poverty are important problems – and again, there’s legitimate disagreement about that; maybe you don’t think so – but if you believe that they’re important problems, to me it makes sense to see immigration policy as secondary to that. We want to have successful integration and upward mobility for people from the bottom. And that’s going to mean thinking very hard. So in the medium term – again, even in a world in which we have zero immigration from now on – that might have to mean devoting more resources to the schools that Steve is talking about. That might mean devoting more resources in terms of English-language instruction and other ways that you’re trying to close the deficits between very poor parents and more affluent parents. This is something that people don’t want to face up to, because they see immigrants purely as a workforce. Gosh you know, what’s going to happen? You know, who is going to be the janitorial staff? Who’s going to do X, Y, Z? Well, you know, that is a very narrow perspective, because it forgets that the thing is that people who are workers today have children who are going to become workers of the future. And they might not be able to become workers who are going to be able to leap into the top half of the hourglass. MR. KRIKORIAN: Thank you, Reihan. Juan. Oh, here, why don’t you use this one? JUAN RANGEL: Thank you very much, Mark. And Steven, thank you for the invitation. And Peter, thank you for the introduction. I think I’m going to come at this in a different way and, as Mark pointed out, kind of my own experiences and the work that I’ve done certainly over the last 25 years. I was the founder of a network of charter schools in Chicago, the UNO Charter School Network, with about 7,500 students. Ninety-eight percent of those students were Hispanic, and 97 percent of those were of Mexican descent; the vast majority of them low-income, a higher percentage of English-language learners as compared to the Chicago public schools. Chicago is where these schools are at. The reason we started the network is one of the reasons I think Steven’s report says the impact on immigration. And we’ve been talking about immigration for about 30 years now with no real solution at hand. Over that time, our communities have just exploded with immigrants, and primarily in neighborhoods like ours, where I come from, primarily Hispanic. And when you think of Hispanic, across the country 64 percent of the Hispanic community is of Mexican descent. The second-largest group is Puerto Rican at 4.5 percent. So that kind of gives you a big number of a group coming from one part – not even a region – from one country, descendants of folks certainly, like my parents as well. And so in that time, in the last 30 years, we’ve seen explosive overcrowding in the public schools. Most of my adult life has been in trying to alleviate school overcrowding because this community continues to grow. And that has real repercussions on a school district, real repercussions on budgets and so forth and delivery of a good education. So about 20 years ago, 20 years ago now, we decided to open up our first charter school, and then in 2005 open up our second; eventually opened up 16 schools across the city. And even with 16 schools in key Hispanic neighborhoods, that was barely a dent on the overcrowding. So that makes it very real. But I think what – we’re trying to do two things: Alleviate overcrowding, on the one hand, and the second is prove what’s doable. And what was mentioned a little while ago about trying to get that group of folks to the top percentage in terms of performance, I think we saw that as our challenge. What do we have to do to showcase what’s possible with a community like this, and certainly with students like ours? And there isn’t a magic bullet, but I think for the most part is looking at this community as a community that has great potential. And I don’t want to look at it in terms of just the idealistic view, but certainly understanding that this is a community that comes here looking to get ahead. It’s not a community that’s looking for the handout, although I think there’s plenty of evidence in terms of showing where we do take advantage of the handouts that are offered as well. Given the population that we were serving, we decided to go completely the opposite way of what the Chicago public schools was doing; a high percentage of English-language learners, yet we chose to do an English-immersion model. Now, that flies against kind of political correctness. It flies against what some research would say is best practices and so forth. Yet our children were learning English at a much rapid pace than the neighboring public schools. Our test scores were surpassing those of the Chicago public schools as well, which allowed us to continue to grow and open up more schools; a high percentage of kids going on to college and so forth. Not to discount the challenges in neighborhoods; we have overcrowding in our neighborhoods. We have gang problems in our neighborhoods and so forth. And I think in some way it’s a microcosm for the country in terms of what we have to do. MR. RANGEL: (Laughs.) I think that’s the challenge that we have. It’s not – I don’t believe that the problem are the immigrants, although there are challenges there. It’s are the institutions prepared or is there a will to want to challenge this community? On the assimilation part, I think that’s – we saw our schools as that vehicle, as the mediating institution to help immigrant families, immigrant children, to assimilate into a broader American society. We saw our schools as – again, the irony is that we would be known as having Hispanic schools, yet we would always say, well, actually, we have American schools, right? And it’s how do we help to Americanize our children. And some of those words are harsh words, right, in terms of how they’re perceived by a lot of other folks; certainly a lot of the activist folks on the left of center politically. But those are words that we would use. It’s the Americanization of our community. It’s the assimilation of our community; and just being very honest about what we’re trying to do for the benefit of that community and for the broader society – integration, a softer word, but it’s also part of that, right; the integration of this community into the broader society. And maybe a place like Chicago, that’s known for its different ethnic groups – it’s the place that has the largest Polish community outside of Warsaw; it’s the place where we all – just a few weeks ago, we were all Irish on St. Patrick’s Day. We dyed the river green and so forth. And as I always used to joke, the next great American holiday will be Cinco de Mayo, thanks to the branding of Corona beer. And so those become kind of our reality in terms of what does America look like at the end of the day. But to me, the assimilation of a community comes at the point where immigrants feel they have a vested interest or a stake in the success of this country. And that we saw as our point in terms of the schools that we were running, where we see our kids with a future, where they see themselves with a future in this country and the success of this country, that seems to be absent in the institutions that we have across the country. And unless we have that, then we have a bigger dilemma. And not all the kids across the country are going to graduate from college or become lawyers and doctors. We will have other problems. And are we equipped to handle that? I think that the challenge – I think the challenge of assimilation has less to do with the students or the families. I think it’s more of a political problem that we have, and our willingness to face up to that question of what does assimilation – what is assimilation? What is Americanization? What does it look like? And we kind of dance around it, right? I think our community – you think of the undocumented community, I think it’s a very pragmatic community. These are folks that come here, they want to work, they want to get ahead. I don’t know that these are folks that want to stay, OK? But these are folks that, for the most part, end up staying. And that’s the challenge that we have. I can tell you from my own experience that that’s my parents’ story. They came here in 1952, newlyweds, thinking they were going to be here for three, four years and someday go back. And guess what? Three, four years became 40, 50 years. We were all born here. And at some point, we make the best of this, right? And I think it’s a recognition of that, and challenging folks to see what the future is going to be. Citizenship is an important part of this, right, in terms of how are we challenging our folks to become citizens when they’re eligible, but not because they ought to do this – and certainly in the age of Trump – because of – to protect your rights or protect your family and all that, but more in the aspirational sense of what does American citizenship mean? Back in the 1990s, we were part of a big movement to help folks – most of the folks that came from the ICRA days that became U.S. residents, we knew that three to five years, those folks—a large group of folks would be eligible to become American citizens. But our campaign to help folks to become citizens was not a scare tactic. It was more aspirational of what does it mean? You’re here. This is your country. You have to make an investment. Citizens, get them to vote, but – yes, but also in terms of home ownership, investment in their communities and the development of communities. There is the opposite side, of communities that don’t have the immigrant – the influx of immigrants, like Chicago. And Chicago has benefited greatly from the influx of immigrants, specifically Mexican but also Polish and others as well. Chicago would be a very small city today if it weren’t for the immigrant population. There are benefits. And the neighborhood where I live in, the little village community, has a thriving business strip. It’s the second-largest tax revenue-generating strip in Chicago. Second – far second, albeit – to Michigan Avenue. But it shows that there’s the sense of entrepreneurial there in those neighborhoods. I think part of the challenge is not only looking at the positives, but owning up to some of the negative effects of immigration. I mentioned those earlier. Same neighborhood where I live in, great business strip, great families, but we have a big gang problems, right? We see the graffiti on the walls. We hear the gunshots at night. Those are very real for families. So we can’t ignore that. And we have to own up to those as well. I’m an optimist. I tend to see things in a positive way, where the immigration has been good for this country. Although, in terms of – looking at it in two ways, in terms of the folks that are here already we have to figure out what we’re going to do. I don’t think there’s going to be mass deportation. I don’t think there ought to be mass deportation either. But we have to look forward also to where do we go from here. And I would be one to say that our folks – our community is very pragmatic. It’s a community that would say if, as we move forward, there’s any attempt to do kind of some type of legalization, I think this is a community that would be very willing to accept greater enforcement at the border, greater enforcement in the workplace as a tradeoff. It’s not a community that’s closed off. Now, I say that in terms of the community versus the activist community. Those are two different things. And that’s where the politics come in. But as a people, I think this is a very pragmatic community. I think it understands the problems of immigration, but also it seems the positiveness there and the willingness to do the tradeoff, one for the other. MR. KRIKORIAN: Thank you, Juan. Just one point I forgot to mention, the map that you see up there, it’s online. It’s not just a picture. It’s actually an interactive map. You hover your cursor over each one of those units, PUMAs they call them – I don’t know where they come up with these acronyms in the Census Bureau – but each of those units as Steve, I think, he says in the report, they’re – each one if the equivalent of maybe five or 10 high schools-worth of kids. So it’s to get a sense of what the scale is. MR. CAMAROTA: If you zoomed it in a little bit, you can see it’s very close. MR. KRIKORIAN: Right. And so – and so you get a lot of information about each one of those units. The D.C. area has, I don’t know what, 40 – 30 of them, or something? I mean, it’s – in other words, it’s pretty granular. It’s very interesting. We’re not going to go into it here, but online you can take a look at that. Well, since I paid for the microphone and the ice water, I’m going to ask the first question. And my sense is that there’s really a common thread through much of what everybody is saying, or at least a common corollary. You know, Peter was talking about directing resources to result in assimilation going more the way we would like it to go, which I think is what people mean by assimilation, whereas – I mean assimilation in the sense of just, I mean, people adapting to where they live isn’t what people, I think, mean by assimilation. They mean what you’re referring to as a kind of positive assimilation. But you’re saying that, you know, that takes some work and resources and effort to direct it in that way. Reihan, likewise, is talking about the interventions necessarily if we’re going to avoid a kind of hardening ethno-racial caste system and, you know, persistent poverty from parent to child to grandchild. And Juan also talking about, you know, overcrowding in these schools. Well, it seems to me, isn’t one conclusion – not the only one, but in a sense the first one – the first corollary of everything you guys have said – is therefore there should be less immigration? In other words, aren’t numbers of the essence? They don’t solve everything. They don’t – it’s not a magic wand. But it seems to me reducing the – it doesn’t change the issues, we have to deal with immigrants who are already here, obviously – but doesn’t turning the tap down, you know, in a sort of – as your sink is overflowing, in a sense – doesn’t turning the tap if not off at least turning it down have to be the first thing you do before or as a precondition to all the other things you guys are suggesting? MR. KRIKORIAN: Use one of the mics if it’s working. MR. SKERRY: Does this one work? MR. KRIKORIAN: Some of those less-skilled – less low-skilled immigrants. MR. KRIKORIAN: Yeah, OK. Well that’s fine. I’ll amend that then. Isn’t the corollary less – reduce low-skilled immigration in the future? MR. SKERRY: Yeah. Yeah. But there’s – if I might, there’s a – there’s another dimension to this that’s floating around here. But, and it comes up in what Reihan was saying, because his whole scenario I find really intriguing, about ethno-racial inequality. It’s not clear to me whether we’ve got it now or we’re heading in that direction, but I get the point. But I think it overlooks a really important part of the problem, which is that – is the African-American piece. Because while the ethno-racial immigrants of the sort that I think Reihan is talking about may struggle to get ahead, and I don’t deny that in his scenario about increasing inequality, obviously, and the difficulty of moving ahead. However difficult it will be for non-white-defining or non-white-looking immigrants of the sort that he’s talking about, their problems are going to be very different than the problems of African-Americans. And so to talk about ethno-racial inequality, to me, just kind of obviates those important differences. And I think it’s a – it’s a tendency that reflects our very changed political institutions and political culture, which is also an aspect of assimilation. It affects the political assimilation of immigrants, such that they are encouraged to define themselves as a racial minority, much as African-Americans. That’s certainly the political temptation for Hispanics. And that’s a – that’s a political – that’s a political choice that we make. And the kind of inequality that Reihan’s pointing to I think is a serious concern, but it’s not clear to me it’s an ethno-racial concern. Or, if it is an ethno-racial concern, it’s going to obviate the particular problems and historical legacy and claims that I think African-Americans have on American society. And at the same time, it’s going to suggest to the American people that we have an ethno-racial problem that looks, feels, and plays out like the – like the problem and the obligations we’ve incurred to African-Americans. And that’s going to produce the kind of reaction we’ve gotten to immigration today. I think part of the reason why people are so upset with immigration is that immigrant advocates have been drawn to define themselves to similar to those, if not identical, to African-Americans. And if any honest American looks at the situation of African-Americans, they will conclude, well, this has been a problem. We mistreated them. We haven’t acknowledged what we’ve done. And the enduring legacy of what we’ve done and our inability to deal with it in a forthright way, however well-intended, continues to create big, big problems. Well, if that’s how immigrants are defining themselves and their problems, why would any rational American say we should have more immigrants? We’re inviting in more problems. MR. KRIKORIAN: OK, yeah. Let me – quick comments from you, Reihan, and if you have anything to say, Juan. Then I want people to be able to ask questions, because we’re running late. MR. SALAM: Just briefly. I mean, when you’re talking about ethno-racial inequality, my point is not that group X or Y is inferior or what have you – far from it. My argument – race is a dynamic process. It’s not a static process. So when you’re looking at, for example, a lot of the Hispanic immigrant influx, you have big differences between folks who have the parental resources, the cultural capital and what have you, that basically brings them into what you might call the mainstream of society, where they oftentimes form social attachments to people who are also upwardly mobile, and what have you. And then you have a residual population of people, oftentimes those who were brought in as labor migrants, who are separated from the broader population, oftentimes find themselves living in hyper-segregated communities. And over time, there is a more intense identification as a separate racial group. You even see this in terms of who answers, you know, kind of the questions on the Census in one way or another. So I’d say that, you know, this is not something that’s fixed. It is something that I believe we can prevent and mitigate over time, if we had better policies that were oriented towards immigration. And to Mark’s original question, I’d say that, yes, I think that having an immigration policy that takes as its first priority: Are we going to be able to successfully integrate folks? And also, are we going to be able to have – create the resources – the fiscal resources necessary to devote the resources we need in order to help integrate the existing immigrant and second-generate populations into the country? That’s how I see it. So, you know, I don’t believe that skilled immigrants, immigrants earning high incomes in high-prestige occupations – I do not believe that they are superior to anyone else. By no means do I believe that they’re superior. What I do believe is that they can help ease some fiscal burdens going forward, whereas when we’re talking about people who themselves have suffered from multigenerational poverty and what have you – if you are a refugee fleeing some kind of persecution or disaster, that is a good reason to be willing to make that investment, be willing to make that sacrifice. When we’re talking about labor migration, I think it’s a separate question. And that’s why I do favor a more selective immigration policy. MR. KRIKORIAN: Thanks. Yeah, wait – questions from the audience. Wait for the microphone, please, to get to you. OK.
Q: Oh, hi. Thank you very much. You guys have been great today. MR. KRIKORIAN: We need a short question, please. Q: Yes, no. But people pay the IRS using other people’s Social Security numbers, and that’s over $200 billion every 10 years. I’m just suggesting that why don’t we follow the money? You’ve also got incentives for bad behavior. People come here, say from Mexico. Felipe Calderon is on record saying they want to come up for the economic opportunity and they want to be able to go back home. MR. KRIKORIAN: OK, sir, we need a question, please. Yeah. Q: But they have – the money – we’re just wasting money in many different ways. We’re almost guaranteeing human traffickers an income because of our bad policies. And the two – the other people – and the I-10 is wrong, completely wrong. Follow the money. MR. KRIKORIAN: Yeah. Thank you. Thank you. Yeah, next? OK, yeah, well – OK, you first and then – no, no, no, go ahead. Go ahead. Q: Oh, yeah. No, this question is for Reihan. I follow you quite a bit and have read a lot of your – a lot of your pieces and follow you on Twitter. And like the announcer said, you are a busy man. And so I was wondering if whether you or your organization – whether you guys receive or have received any money from John Tanton or any affiliated groups or donors, like the Carthage Foundation or the Federation for (Carolinas ?) or Sarah Scaife? MR. SALAM: You should consult with the National Review Institute. They might have an answer to that question. I don’t. I’m not aware of receiving donations from any of those groups, but I’m sure that they’d be – perhaps they could follow up with you on that. MR. KRIKORIAN: OK. Thank you. Paul? Q: Hey, Steven, I have a question for you. In the areas that are pink to red, have you already lost this battle of assimilation? And as you go into the next 20, 30 years, are we going to see the yellow areas turn red? I mean, what’s the future hold on that issue? MR. CAMAROTA: Well, I think the way I would put it is the challenges are greatest in the areas of heavy immigrant settlement. But, you know, no, I don’t think anything’s lost. That would not be the way I would approach it. I think that with good public policy we can always – we can help the immigrants not only improve their economic situation but also, as John Fonte at the Hudson Institute would say, patriotic assimilation is very important. The idea is that they come to identify with American and her history. And I do think, obviously, it’s going to be much harder in an area where 65 percent of the kids are from immigrant backgrounds than where 5 percent are. But I still think it’s possible. But as Mark said, less immigration would make a whole lot more sense to help out. And I think it would make less – make a lot of sense regardless of the education level of the immigrants. But the education level of the immigrants and a more selective system would also be very helpful as well. MR. RANGEL: I would maybe differ on that answer, in that that’s assuming that the folks living in those red areas are the same folks that were living there 20 years, or who are going to be living there 20 years from now. The phenomena that I see, certainly in our communities in Chicago, is that people move up and out. And there’s – there has been a new influx of people coming in. And I would argue that a lot of those folks that have moved up and out have assimilated in many ways. And so I don’t think it’s lost, it’s just who are the people that are living in those red areas today? MR. KRIKORIAN: No, that’s a good point. And that actually get to my original question. I’m on Twitter as well, and – @MarkSKrikorian, for anyone who wants a steady flow of snark and sarcasm – because lot of the problems, challenges our speakers have been describing today, all of them – it’s the kind of thing that on Twitter I follow with: “Solution: more immigration” – sarcastically, of course, because all of these are real challenges, but they are all complicated and exacerbated by ongoing immigration. I mean, as Juan said, in neighborhoods there’s always people who are, you know, sort of moving to other neighborhoods. They’re succeeding and moving out. But there’s replacement – a constant sort of flow. And this forgets and disregards the lesson of the whole middle of the 20th century when we had a pause, or at least a significant reduction – immigration never really stopped. I mean, the Depression was one year where it was negative, but that was an exception. And that really had a major influence on what we now describe as the success of the great wave of immigration that happened before.